Best Mountain Bike Grips - Which One Should You Choose? →Best Mountain Bike Grips – Which One Should You Choose? Best Mountain Bike Grips – Which One Should You Choose? It’s easy to overlook the importance of having bike grips and most of the time they come up just as an afterthought. However, if you want more comfort and a better control of your bike, getting the best mountain bike grips should be your priority. There are basically two types of mountain bike grips, lock-on grips, and non-lock-on grips. Whatever type you decide to go by, ensure that it is easy to install and that it does not slide or spin after installation. In this article, we are going to review the top 10 mountain bike grips, looking into their features and performance. Can it be Cut/Trimmed to Fit? The selling point for the Schwinn Gel Comfort Grip is the extra gel layer that adds a soft touch to it. It is the one mountain bike grip that you can comfortably use without gloves. It makes a perfect replacement for hard and worn out grips. With the grips, you get to enjoy a great controlled ride because it features an ergonomic design with a textured pattern thus improved traction and an increased surface area. It is in color black and weighs just 0.4 pounds plus it’s small in size (1.5×5.9×6.2 inches). Installing it is also super-fast and requires no tools. Again, this grip features a large palm pad area thus offering vibration dampening protection. You can, therefore, rely on it to enjoy your ride on any terrain without having to deal with sore or blistered palms afterward. This grip features Kraton compound thus you can confidently bet on its durability. Basically, it features well engineered rubbery materials with a great integrity for durability. Generally, this grip features a comfortable and ergonomic design, a large padded palm area and it is super easy to install. It gives a softer feel which makes it ideal for longer rides, and it is made of durable materials. It is also very affordable and has a decent look. However, you will need to use Windex when installing; otherwise, you might have a hard time installing. 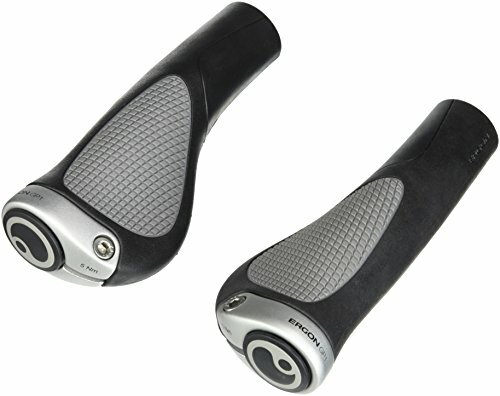 These are German engineered grips, and they feature an ergonomic design for total comfort and control while riding. They have a wider and deeper palm grip for ease of use and comfort. With them, dealing with vibrations becomes easier. Most grips slide when you are ridding but not these. 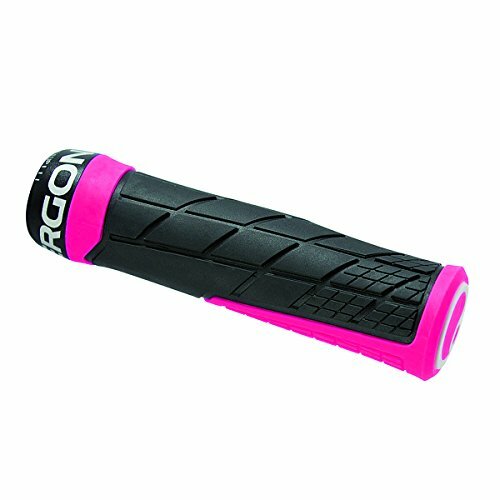 The Ergon GP1 grips allow for a locking end piece thus once locked it does not come off thus preventing any sliding. They allow you to beginner mountain bike rider comfortably on any terrain. These grips’ ends are both open thus allowing you to slide inwards when you want to use the bar ends or even a mirror. These are the best grips when it comes to spreading the pressure over the hands. They actually reduce hand pressure significantly thus allowing you to ride longer before making any adjustments to hands for comfort. Again, they give you better control over the handles thus relaxing the grip hence reducing hand fatigue. They make a great choice for long distance riders. It is a very comfortable bike grip with no hand or wrist discomfort. It does not slide, and it is good at preventing numbing and the tingling feeling. It is also very durable and easy to install. But, it might feel a little sticky at times but not so much that it becomes a bother. 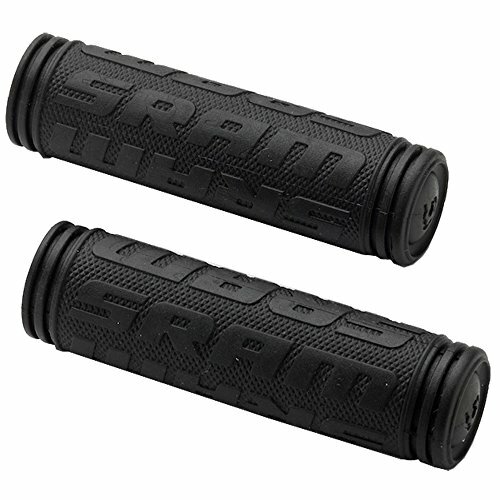 These grips are designed to offer great vibration absorption thus making them great for the bumpy rides. They feature a soft rubber compound that makes it possible for riders to keep holding on even in the rough. They work even better on dirt bikes so if you have both mountain bikes and dirt bikes you can switch from one to the other where need be. These are super grippy grips, and you’ll notice it instantly thanks to the incorporated pattern. The grip remains perfect even when you have your gloves on and also reduces sweaty hands. Installation here is a matter of minutes. All you do is clean the bar then sprays the grip with a little hairspray or rubbing alcohol and quickly twist onto your preferred location. Hairspray acts as a lubricant for a quick installation and like glue to prevent spinning or sliding. They are available in various colors and are very affordable yet high-quality and durable. You will love the less hand fatigue that they bring and you can also trim them to your preferred length. They might start slipping after using them for some time, but you can prevent this by spraying some upholstery adhesive. 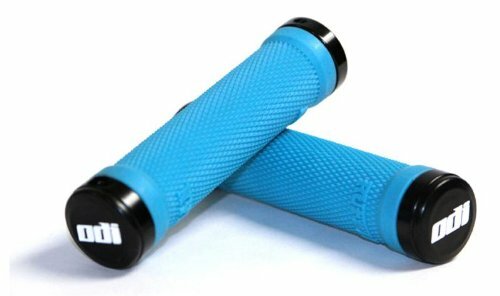 These mountain bike grips feature an extra thick design which makes them feel a little chunkier than standard grips, so it feels a lot better. They do a great job with vibration absorption, and you won’t have numbness even when doing longer rides. They work perfectly well and will remain in place even without applying adhesives. Again, you won’t worry about the grips sliding when riding because the bar end caps hold them in place and you won’t even need to spray or apply adhesive like you would with most other grips. Again, installation is super easy and takes just a few minutes, but you have to be careful to follow instructions because otherwise, it can get a little harder. If for any reason you will need to remove the grips then reinstall them later, these are the affordable mountain bike grips for you. The process takes just a few minutes with an air compressor. An air compressor helps lift the grips off the bike’s handlebars then lets them slip right off. However, to have it easy, ensure that you are following the recommended installation procedure. If for any reason you need the grips shorter, trimming them down is a pretty easy task. To do it right, just put them on either bar then use the bars’ end as a guide to how far down you should go. And, cutting them won’t affect their performance. Again, this grip is made of a soft and squishy material for a comfy ride. They are great at preventing hand fatigue. Also, they are the best in preventing arm pump or cyclist palsy, so they make a great choice for mountain biking. It features dots and SRAM logs thus giving it a low profile grippy. As such, you can have them on your mountain bike’s bars and ride for a long time without any discomfort. They also help you in having a better control of your bike especially when on a rough or slippery terrain. 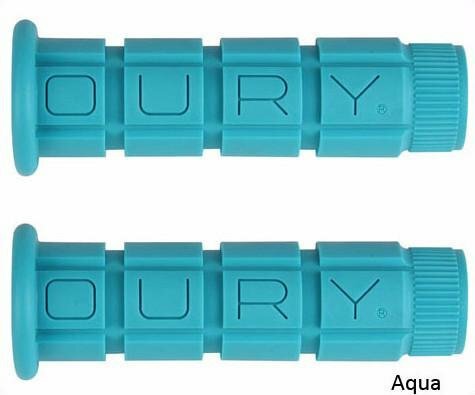 These grips are designed to be used for both kids and adults bikes, and as such, they come in various sizes. The kids’ sizes are perfect for little hands, and so are the adults’. Again, once installed, the grips fit firmly and don’t slide as you ride thus giving you a better control of your mountain bike. If you buy a larger size than your bike’s bars, you won’t have to order another pair as you can easily cut these off to fit. And, once cut, they just work normally, and you won’t even tell the difference. These grips give your hands a nice squishy feel such that even after a long ride, they don’t get fatigued or blistered. They are designed to promote comfort. They fit great and are super comfortable. Installation is super easy with just a little hairspray. All you do is spray the inside of the grip and watch it slide on your bike like butter. Again, the hairspray will act as an adhesive to keep them in place even when riding. The only thing you need to add is bar end plugs because they can get easily beat up at the ends then you will be good to go. The grips come in bright and vibrant colors thus making your bike stand out. So, if you are into nice stuff, you will love them. These grips lock on one side, and they have no problem with movement. They are designed to make your riding better. And, the package includes everything you need to have them on your bars, so you get the grips and screws. They lock into place, and they stay put on the bars. For durability purposes, these grips are constructed using solid material and design, and you can use them for a long time without showing any signs of wear or tear. Again, they grip very well to give you a better control of your bike, and they are very affordable. The grips feature a soft rubber construction that gives them a better cushioning while also making them extremely tacky thus giving you a firmer grip which is great for either wet or dry hand. Again, the grips are super comfortable on longer rides and do great in reducing hand fatigue. Whether you love riding your bike with gloves on or not, you will find these grips comfortable. They are nice and tacky which makes them a fantastic buy. They are thin but still grip very well. However, if you have sweaty hands, you are better off using them with gloves to improve the grip. The grips will also offer more hand support and a more usable grip surface thanks to the custom flanged design. Again, the package comes with a pair of grips and also clamp bolts included. The overall construction is also very solid thus giving them a better durability. You have the option to either go mild or wild with your grips because they came in various colors. Again, the installation process is quick and easy as it requires no tools. The locking clamps make them a better option because they won’t slid out of place. Again, the thumb flange gives a nice touch while also adding a little more sense of security and control. The material and pattern of these grips help them maintain their grip whether your hands are wet or dry. This is a great relief for people with sweaty hands, and they don’t like having gloves all the time. 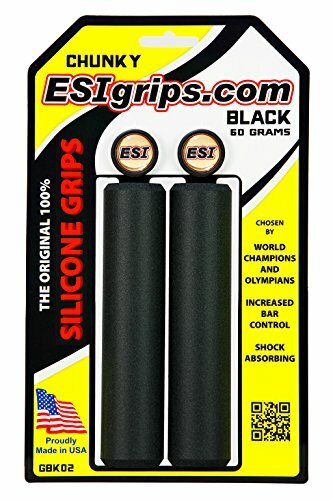 Generally, these grips are super comfortable, and they are not too spongy to cause hand fatigue based on your grip style. If your mountain bike has wider handlebars, the GE1 grips will make a perfect option. Again, the grips come in various colors allowing you to have a color that will not only look beautiful but also stand out. They, however, come in one size so you might want to confirm if the size is right gear on your bike before ordering. These grips feel soft but not too much to cause hand fatigue. They have just enough softness to make your hands feel comfortable even after a long ride. Again, they do a great job in preventing arm pump and cyclist palsy and also reduces pinched nerves. 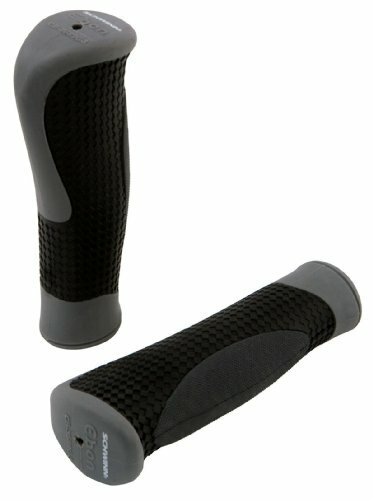 Because these grips are designed for use in long rides, they feature an ergonomic grip as well as a little swell in the middle/index finger area to add comfort while also allowing you to hold on it. They are slim but with enough cushion for comfort. They also lock in nicely with zero slippage even after long rides, and they also look awesome. The material used in making these grips is rigid yet soft enough for perfect absorption of impact off your wrists. If you experience numbness when riding, give these grips a trial because they might be all you needed. They have enough cushioning to provide great shock absorption, and this means that your hands will feel fresh after every ride. The package includes a pair of grips and the clamps. With two clamps, grips have a more solid feel on the inside, and they stay in place throughout the ride. Again, they have a great pattern that grips well, and you will enjoy it even if you always ride full finger. These grips are not overly spongy/soft, so the help eliminate hand fatigue. They just have enough cushion to provide a comfortable feel in your hands while riding and this also makes them great with impact absorption especially when riding on a rough terrain. It is made using a hard rubber, so it offers just a little “give,” but you will still find them comfortable even without gloves. The grips come in various colors, and they also have a clean and professional look. They actually look really good on the handlebars and the grippiness is just perfect for any ride. They have a very solid build quality for durability, and they stay put. These are super simple to install, and they fit perfectly. And, they are made in the USA, so the overall quality is top notch. However, you have to be cautious not to over torque the clamps. The first thing to confirm before buying mountain bike grips should be the size. In size, you check the length and the diameter to see if it will fit your handlebars. Not unless you enjoy playing around with tools, getting easy to install grips is the best option. Some will require adhesives to stay put when riding, but some fit perfectly. Apart from providing comfort, bike grips are meant to help you have better control over your bike, and the only way this is possible is if they have great traction. You can tell this by the kind of pattern it has. Anything is only durable if it’s built from high-quality materials. There are various materials used in making grips so find out about their durability before placing an order. The impact is always there when riding and the only way to beat it is if your grips have enough cushion to absorb it. However, too much softness might not be too comfortable. Therefore, go for medium firmness/softness. Ergonomic design helps in minimizing fatigue. Most cheap mountain bike users complain of hand fatigue especially after long rides, but you can avoid this by investing in a bike grip with an ergonomic design. Whether you love going wild or mild when it comes to mountain bikes, having several colors to choose is important. Some bike grips can easily be cut/trimmed down to fit, and this is advantageous especially when you are not so sure about the perfect size for your handlebars. Again, you can also find it easier when you want to use them on another good mountain bike as long as their performance remains the same. Sometimes it’s hard to tell if the grips will stay put after installation. Thus, to be on the safer side, you can always go for those that come with bar end caps because that way you are guaranteed zero movements once you have the caps on. 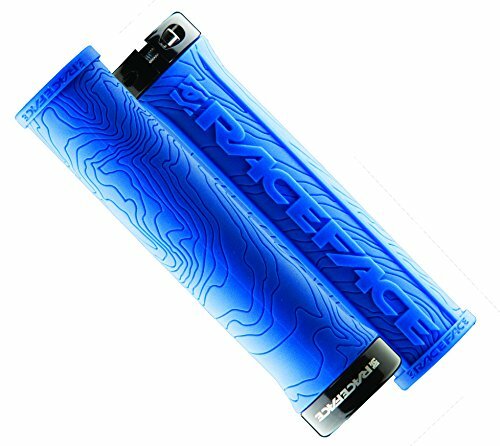 There are many ways that you can change your riding experience and getting the best mountain bike grips could be the most affordable option yet bringing the most difference. With the right grip, you can enjoy a more comfortable ride, reduce vibrations, prevent or reduce hand fatigue, and prevent sore or blistered palms. 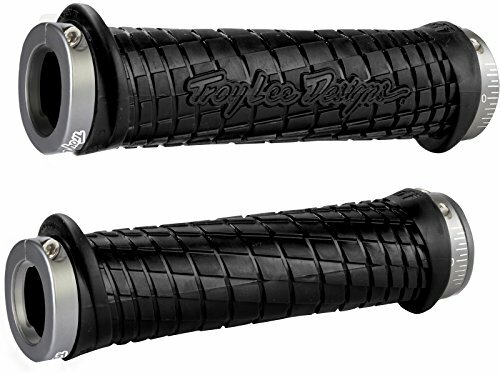 Luckily, most of the best bike grips are very affordable yet durable and easy to install. We hope that you’ll find our list helpful and that you will enjoy your next ride.